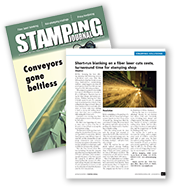 All-New Stamping has been serving the music and entertainment industries for much of the time we’ve been in business. We have worked with some of the biggest names in the industry to bring them the quality stampings they have come to rely on. All-New has the reputation of working with both start-ups and established companies to find the most cost effective solutions to get you the best components for your application. Whether it’s about the right resonance or the best finish, we have the industry experience to manufacture parts that meet you exact specifications. This is why our customers stay with us once they work with us. Some of the products we stamp are frets, bridges, supports as well as other instrument components. We have over 60 years of experience providing turnkey stamping services for the music and entertainment industries. All-New Stamping is AS9100 and ISO 9001 certified. We are committed to working with you in every area of development through full production. Ensuring that you get your parts when you need them finished exactly the way you want them. This commitment extends throughout our company to bring you the power satisfaction that you are looking for in a manufacturing partner.